Saucony's marketing pitch: The Triumph ISO 2 is going to rock your running world. Upper: Spacer mesh, no-sew urethane welds, synthetic leather midfoot panel, inner sleeve. Midsole: Everun foam topping over an EVA midsole, Everun heel wedge. 8 mm heel to toe offset. 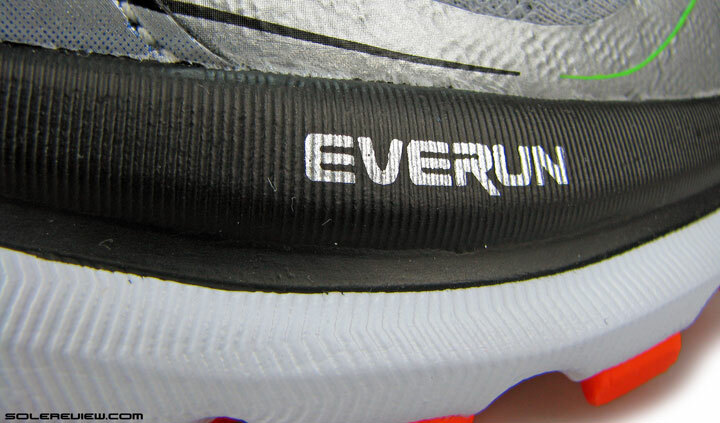 Saucony debuts the new Everun foam on the Triumph ISO 2, but don't expect a marked difference versus the 2014 Triumph. 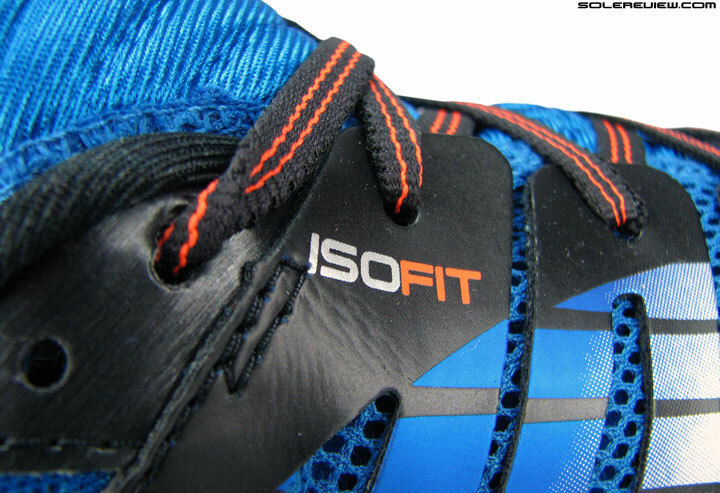 The new model's ride is simply more responsive and firmer, and the ISOFIT upper feels familiar and fits better. Last year, Saucony moved two of its existing premium models – the Triumph and Hurricane to the ISOFIT upper platform, in addition to the then new Zealot. Powergrid – out, Everun – in. These are busy times for Saucony. In just under a year, it has reworked its upper design to accommodate the new ISOFIT clutching system, and changed its cushioning tech not once but twice. The higher priced offerings like the Triumph and Hurricane transitioned from the Powergrid foam insert to a ‘faux’ Powergrid+ last year. And late 2015 brought in the newest ‘Everun’ concept, a cushioning material very similar to the adidas Boost. Even by fast changing industry standards, it is unusual to see the Powergrid+ retired so soon, at least from a marketing standpoint. We weren’t impressed at all with its debut last year, and we actually used the word ‘lame’ to describe it. The Powergrid+ isn’t gone, however. It is still part of the new Triumph ISO, just that it isn’t a marketing darling anymore. On the Triumph ISO 2, it hides in plain sight. 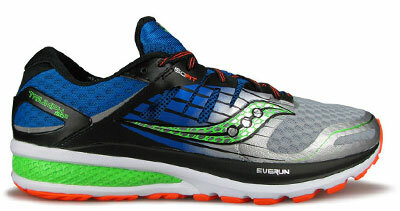 Our guess is that Saucony’s Everun was supposed to be released last year but the brand wasn’t ready to commercialize it. So they dressed up molded Powergrid+ as the back-up tech, cooked up some clever marketing story (20% more cushioning?) and went with it till the Everun train pulled into the station. And what is the Everun anyway, and how is it different from the adidas Boost foam? Does this look familiar? Your hunch is correct, this is similar to adidas Boost. The basic premise is the same as the adidas Boost, the latter being a midsole cushioning tech leased from BASF (the chemical company). 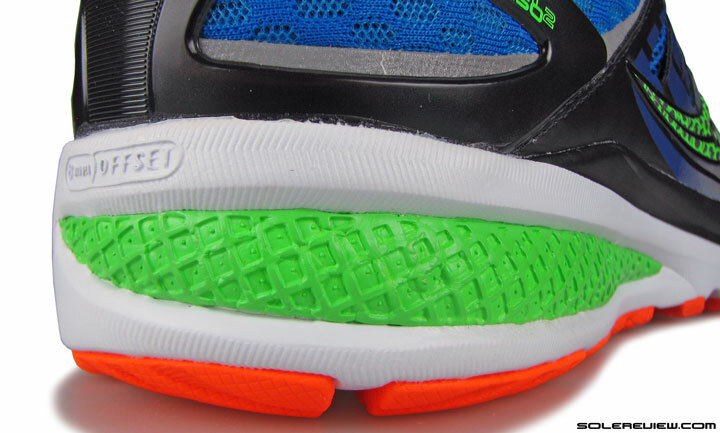 In short, a cluster of springy urethane granules are bonded together, and placed between the upper and the outsole. That being common, there are a couple of differences worthy of note. The first relates to the foam volume, and the second part pertains to its placement strategy. 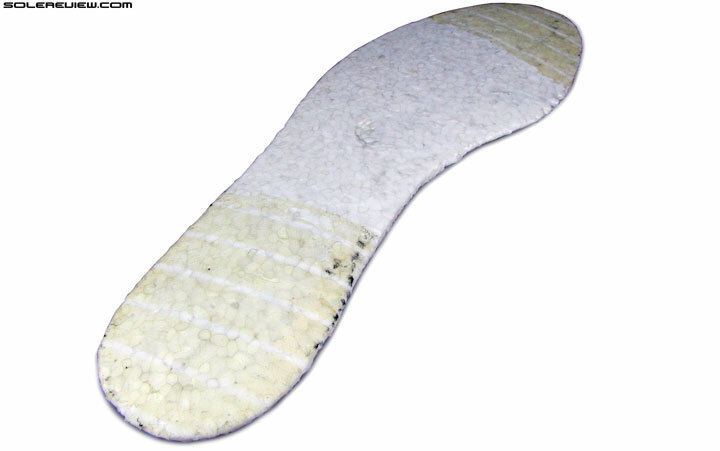 Well, the insole itself is regular foam, regardless of the text call-out. A generously chunky layer of compression molded EVA, that’s what the insole is. Lift the insole, and you’ll be greeted with this. A sliced sheet of granular, co-molded urethane foam. So basically, you have two insoles here. The Everun sheet is placed below the removable sockliner. 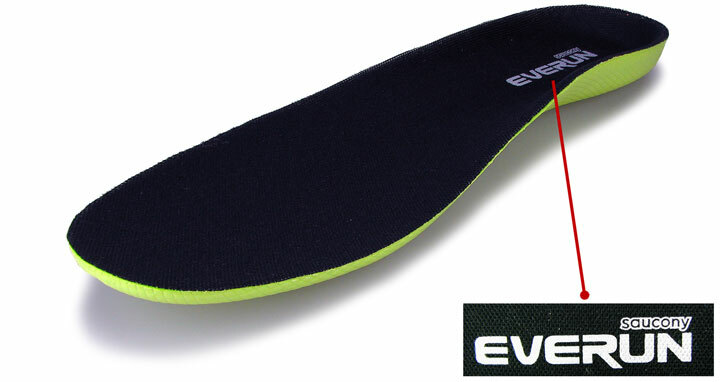 Is the Everun insole removable? Kinda. It has glue strips to help it adhere to the lasting fabric. Unlike adidas, where the Boost foam forms the majority of the midsole, Saucony restricts the use of Everun to only a few areas. On their higher priced models such as the Triumph ISO 2, the new material is placed in two places. 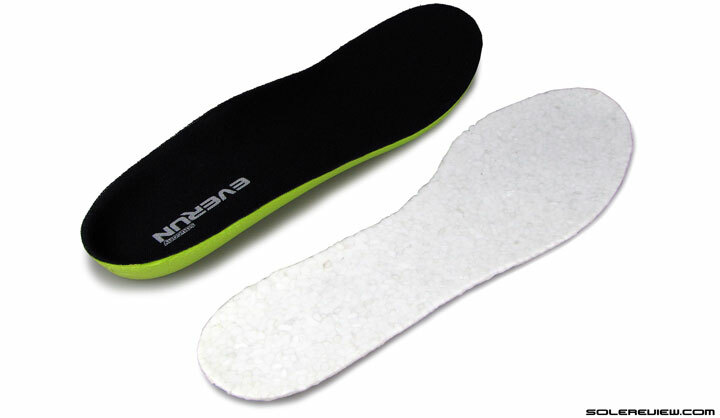 Lift the primary insole, and you’ll see the Everun sheet acting as a secondary insole. Saucony calls this a ‘top sole’, and on lower rung models such as the Guide 9 (and likely the Ride 9), the insole bedding is all the Everun the shoe will ever get. 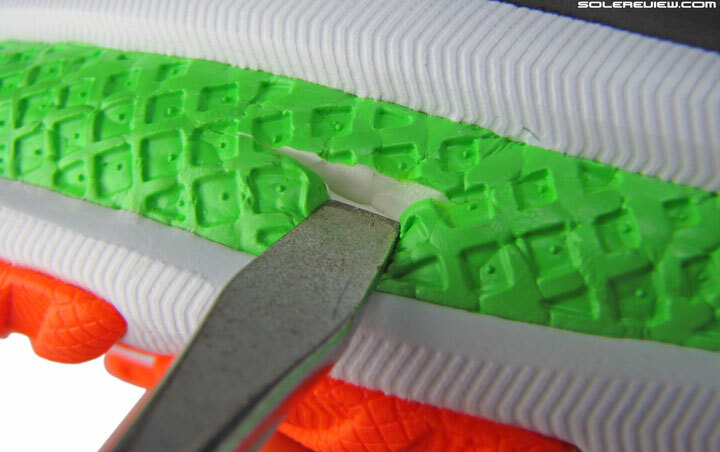 Packing cushioning tech inside the insole isn’t new. adidas has done it a few times; remember the 2008 Megabounce’s swappable insole or the adidas Predator or F5- Tunit football/soccer boots with the ‘Power swerve’ weight balanced sockliner? And so has Nike. They used to glue a compressed airbag with the insole back in the 90’s, a design which they aptly christened the ‘Airliner’. Cheesy, but true. Even the skateboarding brand Vans does it, adding polyurethane tech to some of their skate shoe insoles. And even the Converse Jack Purcell too, with its Nike Zoom Air embedded insole. So you get the drift – this has been around in many avatars. 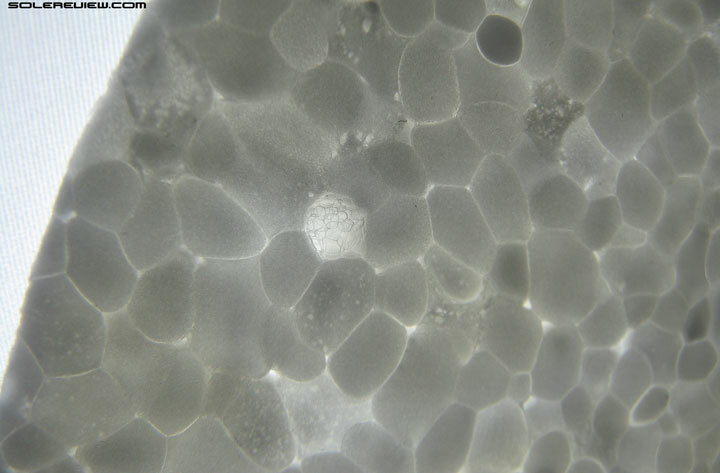 Here’s the second instance of Everun foam. Yes, that green wedge thingy. Saucony has molded the urethane wedge into a waffle texture. The result makes it different from adidas’s version, yet the finishing doesn’t look all that great. Does this expanded urethane compound only come in white? Seems so, since Saucony has gone through the pains of painting it over. 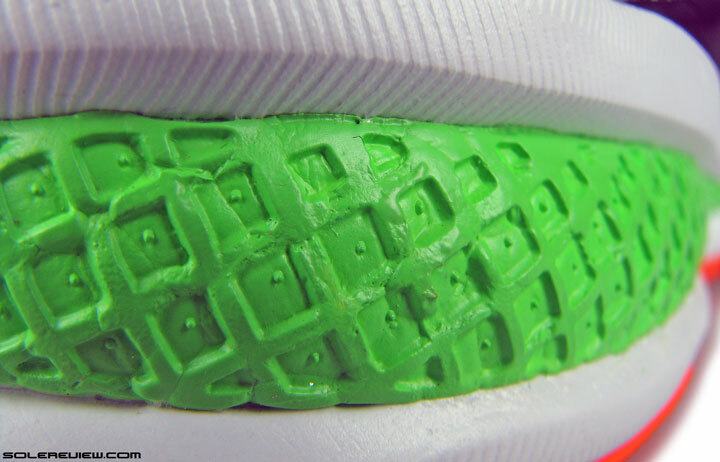 The second Everun foam placement happens to be under the heel, lateral (outer) side to be exact. This is where the SRC crash pad used to call its home once, except that the Everun crash pad is comparatively smaller in size and sandwiched between firmer EVA foam layers. Interestingly, Saucony does two things differently than adidas here. One, it has managed to compression mold the Everun wedge with a waffle shaped texture, and secondly, the section is coated over with an eye-catching bright green paint. Slit the crash pad open, and you’ll see the whites inside. Here, we’ll do the honors. (see picture above). 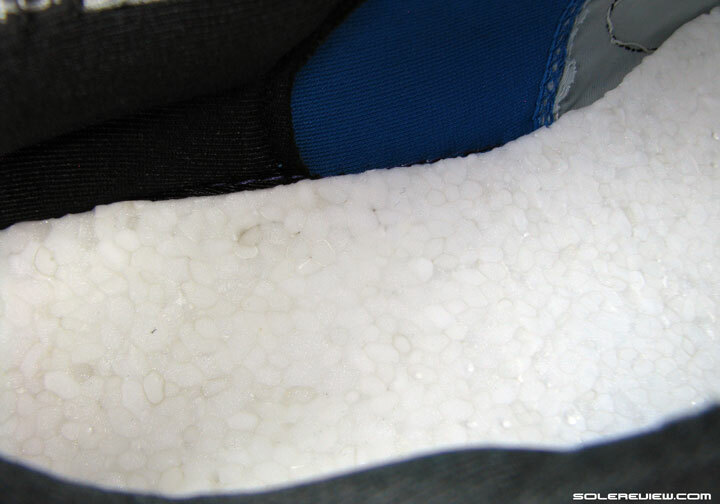 The end result of molding granular foam isn’t very pretty despite Saucony’s best intentions. If you look at the ultra-zoomed in picture here, you’ll observe that the crash pad ends up lacking a consistent texture, a sight which reminds us of a chocolate bar having been in the sun too long. Maybe a year ago, we would have said that the Everun was unoriginal and an unapologetic copy of adidas Boost, but really, who cares? Besides, Boost isn’t proprietary adidas. It is cooked in BASF’s labs, not adidas’s, so like any other material it is going to get around. Like engineered mesh or co-molded midsoles, for instance.